How different can the law be? So… within minutes of each other two comments arrived in The Legal Genealogist‘s email box yesterday that underscore a critical point when using the law in genealogy. And the second, as if anticipating Jeffrey’s question, was from Barbara Vines Little, CG, FNGS, FVGS, and Virginia expert extraordinaire. She reminded me that the colonial Virginia Legislature had also spoken on the subject of priorities for estate administrators. • All of the statutes gave first priority to the surviving spouse. • The 1748 explicitly, and the 1785 and 1819 statutes implicitly, gave next priority to the children of the deceased. • In 1748, a legal representative of a child had the same priority as the child himself. So the executor or administrator of a deceased child’s estate was in the mix. That preference was gone from the law by 1785. • In 1785, the descendants of a potential administrator were expressly added to the mix, so a grandchild or great grandchild would be considered before a parent or sibling, and a niece or nephew before a cousin. That was likely the practice under the 1748 law — but it wasn’t spelled out earlier. What this means for us as genealogists is that we need to be careful in drawing conclusions about relationships between the deceased person and the administrator and always think about the law at the time and in the place when the record was created. Because the law can be very different… even in one place with one history and one heritage. Two super useful posts back-to-back, providing a timeline checklist. Keepers! Great posts Judy. You have such a wonderful way of explaining things in a way us common folk can understand. Sure appreciate the kind words, Michelle. 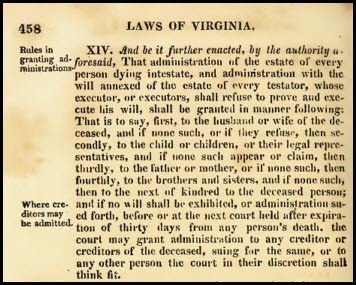 I wish there was a genealogist’s guide to probate laws in each state for easy reference. Compiling the pertinent laws in chronological order state by state would be a great resource for research, and one that both libraries and individuals would likely acquire for their reference collections. I am not aware if something like it already exists. It sure would be nice, Erick, but I’m not aware of any such thing either, darn it. The laws change so much in each state that it would be impossible to keep up. Thus the creation of Westlaw and LexisNexis. The minute a ruling from a court comes down, an update is automatically done to the site to maintain “on point” and case History. These are not inexpensive sites for that reason which us why legal research us so key in the legal field. Also, when it comes to a Trust, the Trustee can be a bank, financial planner, attorney, etc. Each state has a site to search the current statutes or check law libraries. Note-the librarians cannot give legal advice or assist in interpreting the statutes. Fortunately, as genealogists, we generally don’t have the “need for speed” that lawyers have. We can take our time, find the statutes and make sure we get it right.